2.4 Care to Try Your Hand? Shop This Recipe! Unlike most of my recent ice creams, this one is conventionally churned. The good news is that it churns up pretty quickly. It also gets firm relatively quickly–about 3 hours or so in the freezer, so you could make it at lunchtime and serve it that evening. Here’s a long pin for you should you want to pin it. This vegan treacle tart ice cream is creamy, delicious and easy to make. You can use store-bought date syrup or make your own. I've explained the process in the notes section. Also, feel free to sub in Lyle's Golden Syrup if you have some. You could even use a light molasses or even sorghum syrup in place of the date syrup. In the jar of a high-speed blender, combine cashews, coconut milk, coconut oil, date syrup, vanilla and salt. Blend at high speed until completely smooth and creamy. If you don't have a high-speed blender, blend until it is as smooth as you can get it and the strain through a fine-mesh strainer. Chill base in refrigerator until cold. Combine 1/4 cup of the base with the date syrup and set aside in the refrigerator. Churn base according to manufacturer's instructions. When base is at soft-serve consistency, add the cookie pieces and churn another minute or so to evenly distribute. Scrape about 1/3 of the base base into a freezer-safe container. Add 1/2 of the swirl mixture followed by another 1/3 of the base, the rest of the swirl mix and the last of the base. Take a knife and run it through the ice cream to mix the layers together just a bit for a nice swirl effect. If you want, press a few more crumbled cookies into the surface of your ice cream. Press plastic wrap directly on the surface of the ice cream and freeze until firm. Allow to temper on the counter for 10 minutes before scooping and serving. Enjoy, and Harry Potter Halloween! Prep Time does not include making date syrup, churning, or freezing time. Place 30 pitted dates in a heavy bottomed saucepan and combine with 3 cups filtered water and a pinch of salt. Bring to a boil and allow to boil for 15 minutes, pressing the dates against the bottom and sides of the pan to extract as much sweetness as you can. Strain through a fine mesh strainer pressing down well on the solids. Rinse out your pan and return the date liquid to the pan, discarding the solids. Bring to a boil and then keep at a low boil until it reduce it by 75%. The flavor should be fairly intense, so if it tastes a bit watery, you will want to reduce it a bit more. 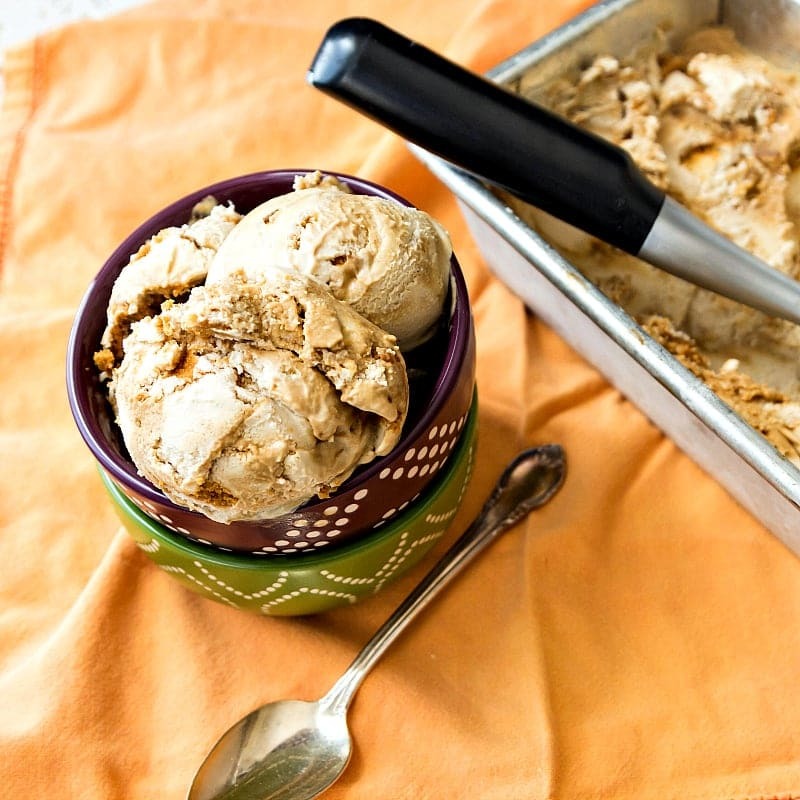 You should end up with 3/4 cups of syrup, and you will use all of it to make this ice cream. Care to Try Your Hand? Shop This Recipe! 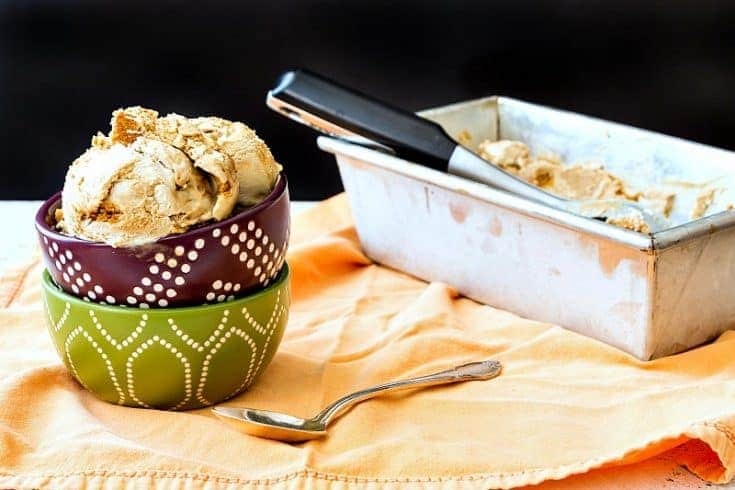 I’ve gathered together affiliate links for some of the ingredients and equipment you’ll need to make this vegan treacle tart ice cream (but of course you can also use them for whatever you need! How’s that for spooky and delicious ice cream! Enjoy it, even if you’re a non-vegan like me. And don’t forget to go see Kathy’s recipe for Vegan Mini Treacle Tarts over at Healthy Slow Cooking! What would you like to do now? 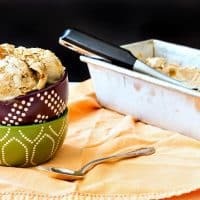 Click NEXT to explore some of my other ice cream recipes.